Ok this was my first time reading one of Mr. Shan’s novels and I must admit I wasn’t wholly impressed. However, reflecting back maybe I am being a bit too harsh. My experience as an adult is to read books aimed at my audience and not one of a younger audience. In that respect, yes, I got it and it wasn’t bad. Quite a short book allowing me to read the whole thing in a couple of hours, something I haven’t done for a very long time. Which on the whole doesn’t say anything too bad about the novel, obviously I couldn’t put it down during these few hours. The story moved along at quite a speed, but with this being the first part of a twelve part series, I am interested to find out where the story goes, how the novel changes in speed and how the characters progress. 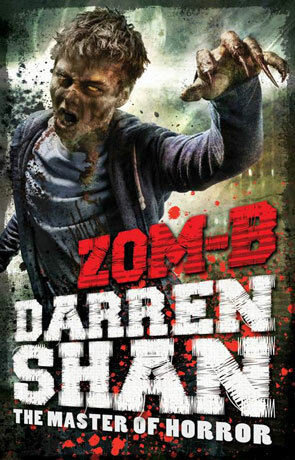 There was a lot to Darren’s novel that I didn’t like. The cliché characters that were a tad too obvious for somebody my age, but I guess would work with a younger reader. The style was simple but that helped the story move along at a quick pace. The ending was I admit pretty good, a great cliff-hanger to lead to the next part and this worked well with making me want to read the next one. I wouldn’t rush out and buy the next instalment, but if I happen across it on some car boot sale then I would snap it up if only to find out what happens to B. The story tells us of B a teenager with a racist father who finds the lifestyle demanded by him hard to ignore and B often finds the temptations of falling in line sometimes hard to ignore. Amidst all this a zombie invasion hits B’s school, feeding on particular brains and converting other’s to their cause. I can’t say too much else here without giving away the biggest twist I have probably ever read in a book. So good in fact that I had to flick back through the novel looking for a mistake in the writing that would catch the author out. It was this one single piece of writing that has made me want to pick up the next book, more so than the story itself. Written on 15th August 2013 by Arron.